What to do with all the dust? We all love the smell of fresh spices, coffee and even garlic floating through the air. These aromas, however, can become quite irritating within a working environment. Our hair, clothes and lungs are penetrated by these fine dust particles and this is where issues begin to arise. Continued exposure to dust can cause a variety of health problems including cancer. Fine airborne dust alone can cause its own set of health problems including breathing difficulties, respiratory pain, diminished lung function and weakened immune symptoms. Food manufacturers, especially emerging manufactures, are quickly realizing that dust control is an important part of their processing needs to protect their workers and their products. Ventilation professionals know that, if possible, source capture is the best way to control dust. Capturing dust close to the point of release will prevent contaminants from becoming airborne and lower the ppm (parts per million) as close to 0 as possible. A ducted cartridge collector or a cartridge collector with an extraction arm can be most effective in this application. Sometimes, a single point of dust collection just isn’t feasible as the application releases dust in too broad of an area. In this case, a booth collector may work best. By surrounding the application in a booth structure and the dust collector pulling air into the booth, filtering the air and releasing it back into the ambient air of the facility, the dust is never released into the facility. Wet dust collection for food processing is relativity new. For over 40 years, wet dust collection has been primarily used for the collection of hazardous dust. Metals such as aluminum and titanium in dust form are highly combustible and must be contained in a wet dust collector to protect against explosions or fires. Over the years, employee health and safety has moved from convenience to necessity in the manufacturing and processing environment Typically, food processing dust collection has taken the form of cartridge dust collectors that utilize piping, explosion venting, complicated engineering to determine water pressure loss (Wg), frequent changes of expensive filters and exhaust considerations. Production changes required all of these factors to be re-engineered and often result in the purchase of new equipment to handle any increased dust loading. In 2010, ProVent, the leading manufacturer of wet type dust collectors installed their first stand-alone system in a food processing plant in Trinidad Tobago. When initially contacted about the need for a dust collector, the discussions revolved around production down time for cleaning and filter replacement. Lingering spice dust was also an issue as the previous equipment was inadequate. A dust sample was requested for testing. The idea was floated about utilizing a wet dust collector to address the company’s issues. After testing the dust, it was determined that the material was soluble and was contained within the orfice / impingement scrub of the wet collector. 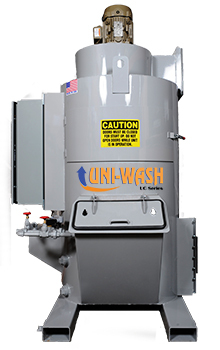 The company proceeded with the purchase of the wet dust collector. The benefits were noticed immediately. Down time for cleaning the equipment was reduced significantly and consisted only of upstream ductwork. The expense of purchasing replacement filters for the previous system was also eliminated. Since, the company has continued to replace their cartridge collectors with wet dust collectors throughout their processing facilities saving hundreds of thousands of dollars in future costs. The orfice / impingement wet collector processes food dust in the same manner as metal dust. When dust laden air enters the collector, the heaviest particles make contact with the surface water and dissolve or sink to the bottom of the collector. Smaller particles must pass through a curtain of water before entering the “scrub”. The scrub consists of a wide area of turbulent water which creates high particle to water contact. After the scrub, particulate must pass through an additional water curtain before being released within a mist. The mist containing the smallest of particulate is buffed and drained back in to the collector. This process will contain 95% of dust down to 3 micron. Sales of wet type dust collectors to food processors have increased dramatically since 2010. Approximately, 75% of sales to food processing companies have been stainless steel wet dust collectors and the benefits have been realized industry wide. Which Down Draft Bench is Right for You?